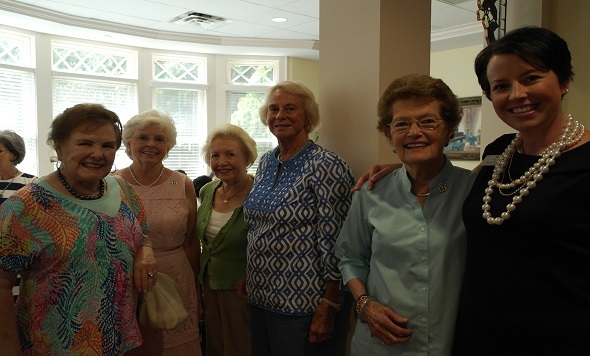 What a wonderful day of celebrating our 30th Birthday at Hospitality House of Charlotte on July 22! We had a wonderful Brunch in the late morning with our friends and founders from the Mecklenburg Medical Alliance and Endowment (MMAE). A guest told her story about what medical crisis brought her to Charlotte, which brought tears to many eyes to hear of the impact our organization has on our guests. We are grateful for your vision and bringing life to Hospitality House of Charlotte (formerly known as MMAE’s Inn) back in 1985. In the eveing we welcomed our donors, corporate partners, neighbors and friends who came by to see our newly renovated guest rooms and to enjoy some refreshments and birthday cake. It was a wonderful evening, and we were thrilled to have so many come by to see what their support provides for our families and patients. It is hard to believe we have served more than 55,000 guests from 49 states and 37 countries since 1985. Many of our families and patients have come Charlotte for the treatment of cancer, to receive a life-saving organ transplant, because of a traumatic injury or are facing other serious illnesses. Families and patients are drawn here from around the world to get the care they need to live a healthier life and we are happy to be here for those who need us. For those who we will lodge tonight and tomorrow, thank you.